A Selfie a DAY, keeps memories AFLOAT, MOBIISTAR, leads the way!! I don’t remember how and when I became SELFIE buff, so much so that I want to capture at least 4-5 special moments a week, be it with family, friends, office colleagues, occasion, non-occasion, or just clicking myself sipping morning tea. I have always believed in preserving memories, however mundane they seem now, but believe me few years down the line, they merit becoming special memories. The addiction rather fascination for selfies has been thickened by my colleague Bhagyashree and daughter Tanya. We love to take selfies at the slightest pretext, no excuse needed, unabashedly, we take selfies when we are out when we are dressed up colour coordinated in office, gone out for simple lunch, birthday celebrations, travelling, not travelling, meetings, conferences…office functions, where not! I think they have become an integral part of our lives, they are our mirror image. All selfies are special for me; some are very special but the one I am going to talk about is truly special. The selfie was taken by my daughter Tanya’s class group, UPES, Dehradun where she is studying Design. The youngsters represent starry-eyed Designers of India, who want to paint the world with their thoughts, colours, designs and patterns. The smiling faces have dreams in their eyes and ambitions in their heart to make it big in life. All look chilled, relaxed and happy amidst themselves and dressed smartly. The Selfie speaks a million dreams that India is cherishing through the eyes of these youngsters. Today, academics is their life, tomorrow profession will be their lives…making India proud with their designs. India – the country of colours, designs, vibrancy owes a lot to these budding designers who are here to make a difference to India’s canvass of future. The collage of selfies featuring above have been taken over a period of time, capturing various moments during work, after work, outings, conferences, meetings with colleagues Bhagyashree, Reena, Veena, Prabha Madhulika, Charmi, Fatima – part of one big family. We never let go any chance of clicking a selfie or getting clicked in a selfie. Now, I need a higher version and better phone to enable me to capture selfies, here & there, everywhere. Mobiistar looks like one phone which will remove hiccups from my selfie sprees which have a viewing angle of 120 degrees. It allows you to obtain a broader capture of your photo or video thanks to its sensor of 120 degrees, which makes more people enter a selfie or a group selfie and more elements when you shoot landscapes. It’s like you have a GoPro-type camera, but without that fish-eye effect. Mobiistar has done very well bringing features that, in many high-end phones, have not yet been able to see. The shots will leave good detail and above all black and white photos without equal in the market. Smartphone users expect better and better photographic experiences, especially in their selfies. The Vietnamese handset brand Mobiistar is set to enter the Indian smartphone market soon and has decided to make India its global headquarters to run operations in other countries. 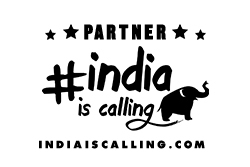 Considering that 4G feature phone happened in India, and 4G is growing fast, this is the market where all the major things in the mobile industry are happening in India. Flipkart has entered into an online exclusive partnership with brand Mobiistar to bring its devices to India, targeting the mid-segment device market. The Indian online retail giant says it is the right time to push feature phone users to upgrade to low-cost smartphones as the piece of low-cost data and availability of online content is finally fixed. I am participating in the IndiBlogger #Enjoymore Contest: A selfie a day keeps forgetfulness away. I am ready to order #Mobiistar on #Flipkart. Marriage made in heaven, celebrated in Mumbai! January 28, 2018, was truly memorable & special day when our cute, pretty Grishma (Lovely daughter of Bhavana & Pradip Shah) who had grown up in front of our eyes, finished her schooling in flying colours, Chemical Engineering meritoriously and became a top-notch working professional, was finally getting hitched to the boy of her dreams. Looking resplendent in South Silk Kanjiveram Saree, dressed as a Maharashtrian bride with her beautiful & noticeable Gujarati looks, she was a national bride. Groom Sumedh Mhatre is the son of Maharashtrian & Malayalam parents, let me add here that Mhatre family integrates many other communities beautifully. Excitedly we reached the venue at 9 AM in the morning as Shaadi muhurat was at 9:27 AM. To make the occasion more special, I decided to adorn a Saree for the wedding after a lot of deliberations as I don’t enjoy wearing a saree actually. But going by the status, Pradip & Mukund (my husband) are childhood friends (Bum Chums) and Pradip being my brother, I was bua to Grishma. Finally, I decided to wear a saree which I picked up from Triveni Saree’s Benarasi collection in Gold with Butis all over, with bright magenta border and pallu in brocade and complimenting blouse. I wanted to have a Rekha like the look (Hope she is not reading) for which I needed to tie it in a special manner and compliment it with appropriate jewellery. The saree was from Triveni’s Lajwanti Collection of Benarasi Saree which has Golden Zari work giving it shimmery but graceful look. Indeed, the saree was very unique. The style is traditional as the designs are inspired by the conventional Benarasi woven work. The saree and overall look got me many compliments, it is another story that I ended up looking like Usha Uthup and not inimitable Rekha. After delicious Jain and Gujarati Banquet, it was time for a reception for which Grishma chose red and gold lehenga, whereas Sumedh opted for a more corporate look with his two-piece, looking very handsome. Grishma looked really outstanding in her outfit with complimenting hair-do and matching accessories. For the reception, I changed into White sequinned and Electric Blue Lehenga, La Chennai Express Style which was appreciated very much by one and all. My day was made! The marriage ceremony was simple, where bride and groom had a great time, receiving blessings from elders and wishes from peers! Pradip bhai is very social and is having a big circle of friends but I and Mukund are very special and he and Bhavana made us really feel so! Many many wishes to the blessed couple!! PS: I gifted Grishma a beautiful Triveni Saree from Sunheri collection! Head towards The Lil Flea Mumbai, this weekend! The Lil Flea, a festival of shopping, food & music, good vibes and perhaps the largest & happiest of its kind in the country is back in the bay! With fairy lights , cozy tents, happy vibes, hundreds of pop up shops from all over the country, experimental and fusion foods, some of the best up & coming live bands, movie screenings, the lil book exchange, a well-stocked bar and a whole host of little things, this festival promises to keep you occupied for a happy weekend! PopUp Shops from all over the country: If you love shopping or simply exploring what’s buzzing in the market, then The Lil Flea has to be on your bucket list. The Lil Flea brings together some of the best homegrown shops from across the country with contemporary apparel, quirkily printed shoes, chic bags, handmade jewellery, digital pop art and heaps of cool things to keep shoppers busy for a whole day or more. The Lil Book Exchange: Bring a book along you can exchange it for another without any price at the Lil Book Exchange. Movie Lounge: Adding a nostalgic touch to The Lil Flea, the team has decided to host some cool classics through the day. Make yourself comfortable on some comfy pillows, sip on a Bira provided as an optional combo offer or simply grab some pop corn. Pre-register for these sessions if you are wise, as the numbers of headphones are likely limited. One Lil Tree: Join this small but amazing movement to help improve the way we live and the air we breathe. Collect your free seeds to plant in your home, adopt a plant or learn the art of organic gardening. The Happy Vibe: You can feel the happiness in the air when you visit The Lil Flea. Happy sellers, happy visitors, fun sit outs, beautiful bohemian décor all come together at this festival to make it one weekend to remember. You can book your tickets on Insider.in for Rs. 249 for a single day and Rs. 400 for all three days. Not to be missed this unique event this weekend. A unique photo-essay showing might of Gold in the ‘City of Gold’ – Dubai. As one of the world’s great gold trading hubs, there is no doubt that Dubai has some of the best gold shops in the world. When it comes to buying gold, be it bullion, bars or kilos, or jewellery Dubai has a plethora of gold shops where you can indulge your passion for the much sought after metal. However, as with any investment, it makes sense to proceed with caution when investing in gold, which, in many cultures, traditionally serves as an alternative to putting money in the bank. The Gold Souk in Dubai truly demonstrates why this Emirate has earned itself the reputation of being the city of gold. The sheer scale and variety of designs available on offer is staggering – bracelets, bangles, earrings, pendants and necklaces are available in white, pink, yellow and even green gold in unimaginable designs. There are over 400 shops to choose from and the predominant style of jewelry available is Arabic and Indian styles with some European designs available as well. Additionally, the prices of gold here are amongst the cheapest found anywhere in the world as there is no VAT or tax applicable on the purchase of gold. Browse several stores before you decide on a particular design and don’t forget to haggle for the best possible price. Ask for certificates where applicable. Also be aware that credit card purchases incur an additional fee in most shops. Have a dekko…what you can dig in Dubai…in Gold! Saree Gowns: Swing to the Silhouette in Style!!! …Model looked fabulous in the outfit, which at hindsight appeared to me like a saree draped differently like the one by Mumtaz in Aaj Kal Tere Mere Pyaar ke Charche…but as she came close I realized that it was something starkly different. Indeed it was an attempt to update traditional saree by fusing it with a gown like silhouette. Here, the outfit was paradoxical mix of fluidity and construction, which combined the saree’s classic structure with the comfort of zipped – up gown. Outcome, your heavily embroidered saree or lehenga will not come in the way when you swing – Girls like to Swing on your best friend’s sangeet. One fine morning, not too long ago, a tweet landed in my account from @triveniethnics displaying their saree gown collection, which instantly caught my fancy and I suddenly recollected seeing them at a fashion show (mentioned above). The outfit in itself is quite exciting as it wonderfully blends silhouettes of a gown with that of a saree and the result is magical. 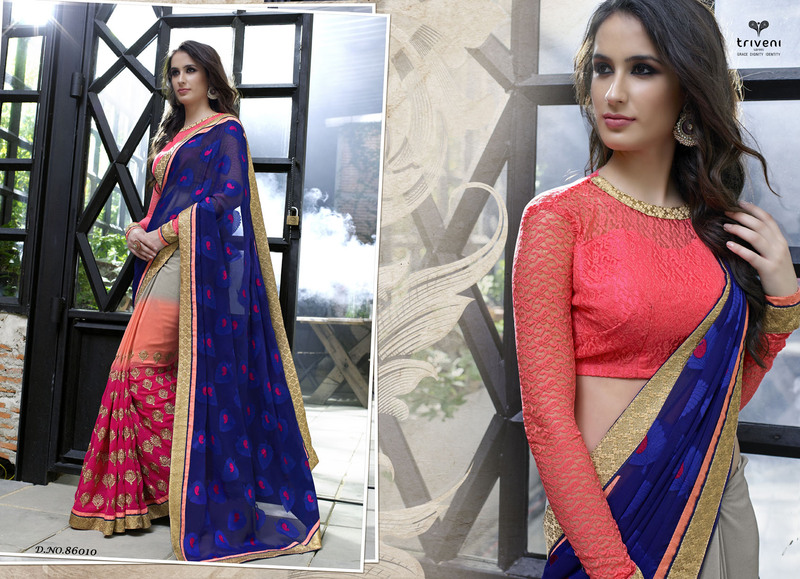 You are adorning the class of a saree and style of a gown in one single outfit. Saree Gown has the comfort of the gown and drape of the saree which gives women the liberty of doing whatever they want. It makes them look elegant & dolled up at the same time, whichever look they want to flaunt. It is an ideal outfit for pretty, young Indian girls who always like to dress to the occasion. It is a fusion of Western & Indian, tradition & trend and style & Silhouette. Apprising about the breathtakingly beautiful collection of saree gowns, Arvind Saraf, Director, Triveni Ethnics said, “We always attempt to give something new to our customers and saree –gown is one of those outfit. We are sure it will attract young upwardly mobile women who do not shirk from trying something new all the time; especially when it comes to occasion wear. Our Saree Gowns are quite unique because of the use of fabrics like Georgette, nets, chiffons with heavily embroidered tops and colour palette is also quite strong which would appeal younger audience especially. Triveni Ethnics are based out of Surat, Gujarat who brings in vast experience in the field of sarees from many decades. Triveni Sarees are available on a pan India level across various budgets, styles, fabrics & fashions from both Online & Offline platforms. They have something for every woman. Don’t miss on checking their bridal collection!!! & of course saree gowns!!!! You can check & order the Saree – Gown Collection on http://www.triveniethnics.com starting from Rs. 1500 to Rs. 15,000. Step into the TRIVENI of tradition, trend & trust! Triveni Sarees tagline reads: Grace, Dignity, Identity! For me the catch line would be: Tradition, Trend & Trust! Every woman aspires these inputs while selecting her saree & Triveni embodies these to the hilt! Surat based Saraf’s vision of Triveni Sarees can be best described as tasteful concoction of colorful contradictions, grace and trend. Their sarees transcend their passion to make Designer Sarees accessible not only to classes and but also to masses. Going by this dictum, their sarees have Designer inputs which every woman aspires with value for money pricing. Considering the highly competitive and price sensitive saree market, these wonderful sarees are a steal for their price tags. No wonder Triveni sarees are loved by not only Indian Women but by women across the Globe. They have a fleet of happy women customers who have adorned Triveni sarees to very special occasions like on a red carpet event or marriage in the family. 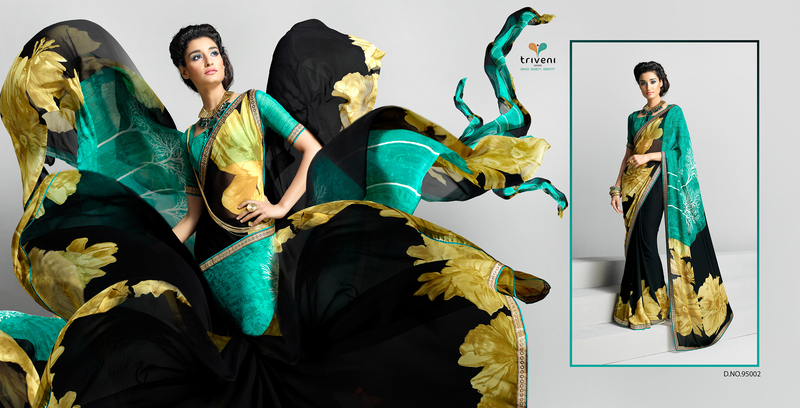 Loved for all occasions, adored by all women…step into world of Triveni Sarees through their exclusive collections. I will take you through them in a sequence so that you know about the collections in detail. Their catalogues are most awesome pieces which we got to glance while our visit to Surat to their office and works recently. I admit it will be difficult to do justice to Triveni’s print catalogues, but none the less, it will be an honest effort. So how and where you can get these beautiful sarees? No need to go to Surat. You can get these ordered from the comfort of your office or home by visiting their website: http://www.triveniethnics.com and sarees would be delivered right at your doorsteps. So what are you waiting for? Navratri and Diwali are round the corner…dress yourself in Triveni Sarees and wear it on these festivals and special occasions. Post your picture on your face book page, tag @Triveniethnics and you become the Triveni Saree Ambassador. How cool is that! And…and Triveni Sarees are retailed through all prominent outlets country – wide. Your can have your pick from there to! While at Triveni Sarees, I felt I was amidst the ocean of beautiful sarees…sarees for every budget, every colour, and every design! Interestingly, for the first time I came to know about the humongous effort which goes into the making of a saree. You would be surprised to know that a saree has to go through many stages – selection of fabric, colouring, dyeing , designing, embroidery, folding, packaging and packing and quality checks on all the stages, before reaching its destination…our wardrobes! 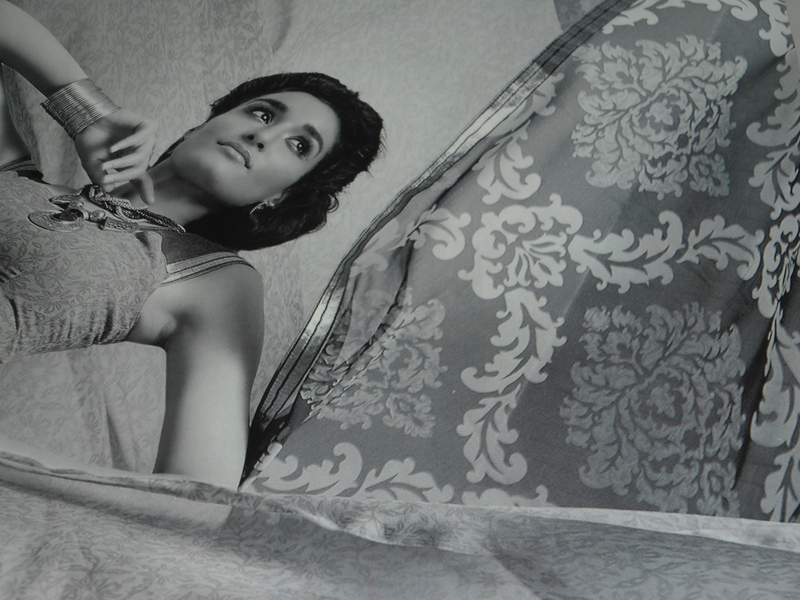 Back stage story will be in a separate post, till then you swoon over wonderful world of Triveni Sarees! This collection is all about popularizing trends for the modern, confident women. 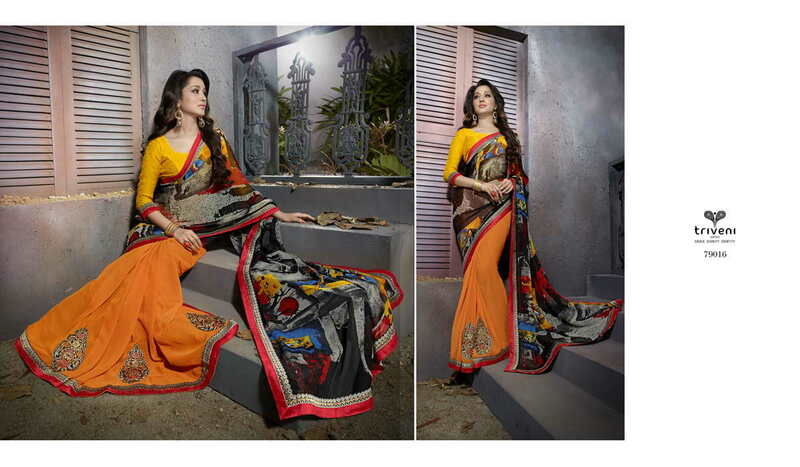 The semi casual sarees gives the impression of exclusive designer wear courtesy their subtle surface designs. Light and Bright colours care combined with a two-tone effect decorated with embroidery, cut work and brocade borders; teamed with designer blouses. The design and placement of embroidery are the highlights of this collection combining ethnic wear into contemporary styles with intricate details. They are heavily embroidered mixed with chiffon, georgette and net fabrics. Fancy jacquard, chiffon, georgette based fabrics are used in sarees. Ideal for women who love to blend traditional and some classical! The collections is all about fusion; fusion of tradition into contemporary style. The designs are inspired by the tradition of Rajasthan fused with modern Bandhini look. The colors are bright yet soothing, even complimenting others well in some of the pieces. The fabric used is chiffon. The most attractive feature of the collection is its border- beautifully crafted with sari and thread work. The collection is beautifully designed for newly married women much because of its colors, surface works and prints. Bandhej print has been widely used in different patterns and colours. Stone work and embroidery are combined to create artistic patterns in blouse pieces. Furthermore, there are different styles of blouses to choose from! Ideal for those who love to be in sync with tradition & trend! Here light and bright colours are combined with a two-tone effect decorated with embroidery, cut work and brocade borders which are teamed with various designer blouses. Important feature of the collection is its subtle variation in designs. They are well embroidered amalgamating Bhagalpuri silk and net fabrics. The sarees are beautified using different surface design techniques like cut work, stone work and embroidery. Whereas sparkle, sequins and foil are used in velvet blouse fabrics. 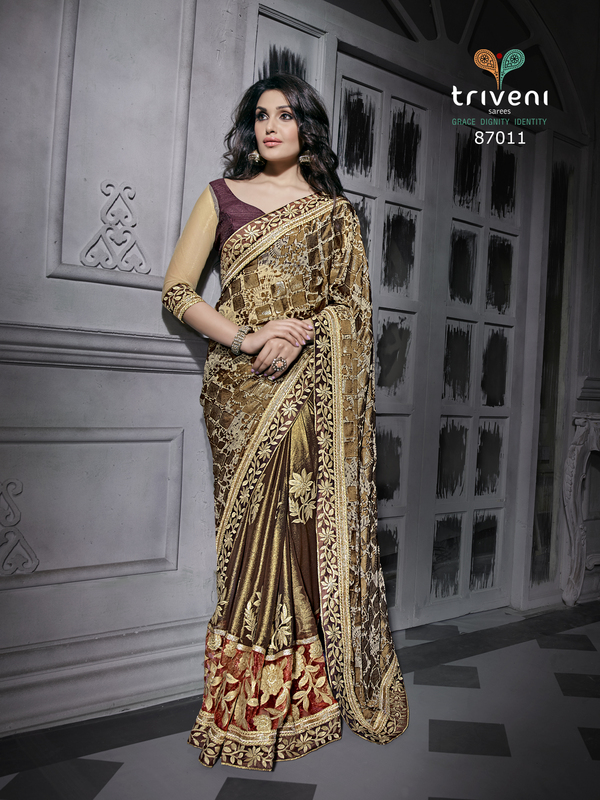 The sarees have a two tone effect and fabrics used are fancy jacquard, chiffon and georgettes. With the use of contrasting colors and beautiful border work teamed with trendy blouse pieces. Make it a Dastoor to have one! ‘Fashion Flow’ is a collection of contemporary style digitally printed sarees which runs on the ground of fashion trends. Scattered floral prints, a mix of bright and pastel tones, tribal block prints and ombre effect; these are some relevant features of ongoing trends. Being lightweight; they are very comfortable and can be stylishly wore to work teaming with matching accessories and bags. These can be draped in multiple ways!. The young women who follow trends will love the digital prints, colours and effects with very creative blouse pieces. The fabrics used in sarees are mainly georgette and chiffon some of the blouses are made of Art Silk. Ideal for young corporate Indian Women! Here the georgette and chiffon mix of printed collection gives a smooth feel of the fabric. The hues of red, yellow, blue and green are wisely chosen to match the occasion. The summer collection goes in trend with beautiful floral inspired prints (scattered and continuous) and appealing patchwork. The borders are brocade with ready made laces. The sari pieces are teamed with crepe jacquard blouses with golden prints. Ideal for would be brides and newly weds! In this collection the sarees are designed with minimal variations; keeping it simple yet classy. The variations are mainly in term of sleek borders, apt embroidery and blouses. The sarees are a wise mix of chiffon, georgette and jacquard fabrics. The fabrics are further embedded with patch work and stone work as a design element. The ombre effect adds to the visual appeal with beautiful cut work and tassels. These surface design techniques enhances the beauty multi-fold. The designer blouse pieces are exclusively crafted with embroidery, net fabrics and variation in neckline. Ideal for contemporary Indian women, young, not so young, forever young! My special thanks to Triveni Team for their design and digital inputs: Shalini Raj, Noopur Sharma & Noopur Chaturvedi when I attacked them in their dens! Based on the survey by Tourism Malaysia, shopping remained as the second major activity engaged by tourists in Malaysia for the first quarter this year. 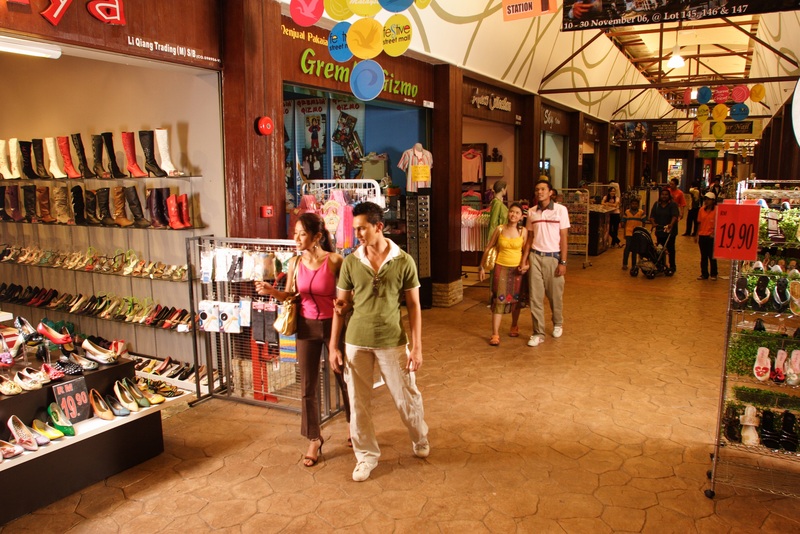 The top five shopping areas for foreign tourists were Bukit Bintang, George Town – Penang, Kota Kinabalu, Petaling Street and Johor Bahru. Clothes and apparels constituted 49.6% of items purchased by tourists, followed by handicraft/souvenirs (45.5%), shoes (21.7%), cosmetic (16.4), and chocolates (13.3%). Tourist expenditure on shopping took the top spot from accommodation for the first quarter of 2015, with an increase of 10.8% to RM4.9 billion against the same period last year. Accommodation and shopping remained as the two top components of tourist expenditure for the first quarter, constituting 54.4%. The growth in shopping expenditure was dominated by regional and medium-haul countries, namely Brunei, Singapore, Japan, Thailand and Saudi Arabia. Factors that contributed to these positive performances included the favourable exchange rate, which was advantageous to foreign tourists and had encouraged them to spend more. Besides that, hoteliers were also offering competitive rates to tourists. As a result, tourist expenditure on shopping was higher than accommodation and they stayed longer in the country. So what are you thinking, head to Malaysia for your Diwali Shopping!